Joy wishes she’d had something like Bento 4 years ago when she was creating a database for a women’s club with hundreds of members. The club has a dozen committees and each one has tasks to keep track of and people to manage. Previously, the club used Microsoft Access, which was like swatting a fly with a brick. 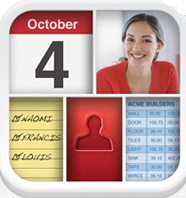 But the new Bento 4 for the iPad comes with 40 ready-made templates for categories such as membership lists, contacts, donations, inventory, exercise, diet, event planning, expenses, customers, etc. Tap “More Templates” and you can get hundreds more free from other users. When viewing data in a table, Bento lets you drag columns around to change the order of things or tap the end of a numbers column to see what the average value is. That’s pretty cool. Another feature lets you add a column for GPS tracking, if the members of any group are so equipped. One of Bento’s features lets you encrypt the fields in a table. This means access to those fields can be restricted to those who have the password. Bento 4 for the iPad is $5 until July 31, after which it goes up to $10. The iPhone version is $5 no matter when you buy it. Bento 4 also syncs data with Bento for the Mac, which is selling for $30 until July 31 and goes up to $50 the next day. Both products are made by Filemaker, which also makes a version for Windows. “Bento” is Japanese for ‘box,” by the way, and commonly refers to a lunch box.